Our Private English Lessons are perfect for students who wish to learn in a more intensive environment. The Private English lessons are available as an add-on to existing courses. Learning in a one on one environment focusing on your personal development can really improve your rate of progress. Your teacher will focus on your learning needs 100%. You will get individual attention to your requirements. Your lessons will respond specifically to your personal English language development. Individual time with a teacher can bring amazing progress, fast! You can book private lessons to suit your plans. Our one on one English lessons vary in length but start at a minimum of one week. Personalised lessons mean that you can focus on specific areas of the English Language. Maximise your progress in other courses by booking ‘top-up’ Private English Lessons. Our teaching staff also offer private ‘top-up’ lessons to our language course students who need to prepare for examinations or interviews. Many of our students add private lessons to their chosen General English, Cambridge or IELTS exam course. Adding top-up lessons to your existing language course can create a learning environment that encompasses ‘the best of both worlds’. The added attention and focus of private lessons can help you make incredible leaps in your progress. Why Our Private English Language Lessons Work! There are few more inspiring things than a teacher and student communicating effectively. A rapport is built through the time spent together in lessons. Through mutual trust, our students feel confident enough to communicate in a language that is new to them. The difference students feel after spending a short time in private English lessons can be immeasurable. Private Lessons with a language tutor can be a wonderful way for you to gain confidence. The reassurance and support from a private tutor can help to give you a really strong start or grow your language skills further. The lessons are tailored to match your strengths and the areas you need to improve. Combined verbal and written techniques reinforce what you’ve learned. Private lessons can be ideal for those that feel that they need an extra push to help motivate them. This environment becomes a place where you can feel confident enough to communicate using your new language skills right from the very beginning. As a student, you have more control over the progression of your lessons. Our teachers will check with you to work out if you would like to take a more active role in deciding the pace and content of your lessons. 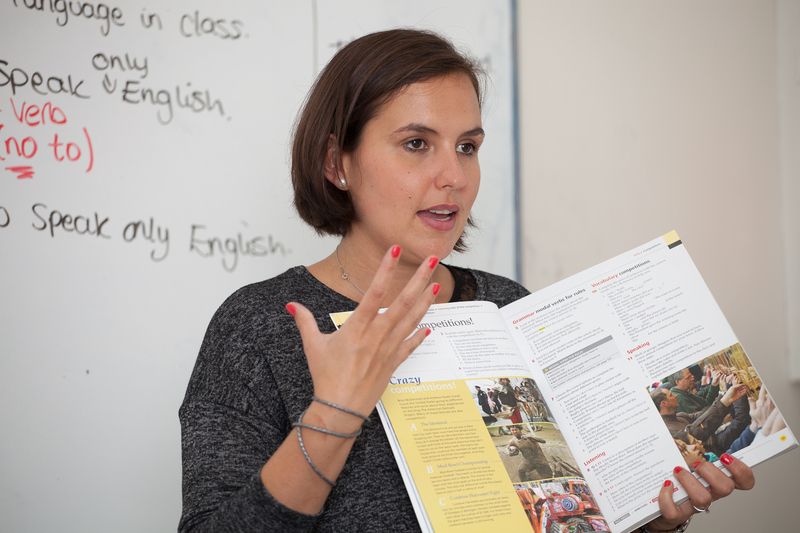 In private English lessons, your teacher will adjust their approach to suit the way you learn. We like our students to make progress at a rate that will exceed their original hopes. Your teacher will ask you about your English language ability so far and where you aim to be, both in the short term and long term. While our students benefit from practising their English skills with others that are also learning, it is fair to say that you may be challenged more when practising with a native English speaker. The constant ability to engage using spoken English means that more subjects can be covered in each private session. If you aren’t sure which English Language Course is right for you, please contact us today. You can choose your own goals and your teacher will help you reach them. This course will be specifically designed for you. Your goals can change during your course. You might realise you want to develop your language in a different direction. In private English lessons you can be in control of your direction. Or if you prefer, you can let your teacher assess your needs and guide you. It is a huge advantage to receive 100% of your teacher’s attention. They will pay very close attention to you. They will focus on your goals. You will get support and guidance specific to your personal learning needs. Do you want to see our amazing prices for private English lessons? Get an instant quote here. Get the best of both worlds. Interaction with classmates is very good for your English development. In addition, the personal focus of private lessons will help you develop faster! You can bring any difficulties you might be having in your regular class to your private English lessons. You can work with your teacher to overcome your challenges. The relationship you have with your teacher is an important part of your learning experience. In private English lessons your teacher will understand your English learning more personally. It is easier to learn if you feel comfortable and supported. When you have a closer connection to your teacher, it is easier to relax and make faster progress.